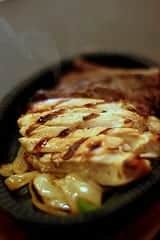 Home » Chicken Recipes » La Mansion’s Chicken Fajitas – Fajitas are a Tex Mex dish that everyone enjoys. La Mansion’s Chicken Fajitas – Fajitas are a Tex Mex dish that everyone enjoys. The recipe is from La Mansion del Rio in San Antonio. This recipe was originally spotted in the Houston Chronicle. Fajitas are a favorite among the fans of Tex Mex. You don’t need to use exotic seasonings, you can make these at home and they taste just like they game from Texas. Give our recipe for Chicken Fajitas a try. Fajitas are a Tex Mex dish that everyone enjoys. La Mansion is one of San Antonio's best-known restaurants. Combine lime juice, garlic, pepper, oil, cilantro, salt and pepper. Marinate chicken covered in refrigerator 1 hour or as long as overnight. Grill on barbecue grill (over mesquite if desired) until done. Cut in bite-size strips. Place on warm flour tortillas and add desired toppings -- shredded lettuce, tomato, salsa, pico de gallo, guacamole and/or sour cream. These were really good and simple to make! We grilled ours and they came our fantastic! We will be making them again.